Process industry installations include chemical, petrochemical plants, oil refineries, electric power plants, pulp and paper mills and wastewater treatment plants. Compact design for minimal space requirement. Corrosion and impact resistant housing. Reduced installation cost due to elimination of pressure manifold and shut off valve needed for separate pressure connection. 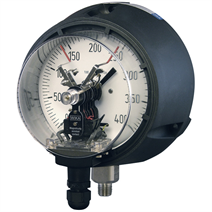 High installation flexibility through ability to retrofit WIKA series 4 1/2" gauges in the field without removal from service. Available with wetted parts of brass, stainless steel or Monel for most process media. Suitable for use with diaphragm seals for corrosive, viscous or high temperature media. The WIKA indicating pressure switches combine local pressure indication with alarm and control capabilities into a single economical, reliable and compact system. Superior to conventional gauge and switch connections, WIKA indicating pressure switches are extremely reliable, have low hysteresis, resist corrosion and have easy set point adjustments. Ideally suited for alarm and control functions on hydraulic, pneumatic and general industrial machinery and equipment as well as on process industry installations, including chemical, petrochemical plants, oil refineries, electric power plants, pulp and paper mills and wastewater treatment plants. CP 3000 Magnetically Assisted Contacts feature one or two magnetically assisted mechanical contacts. The contact assembly includes a built-in Triac switching amplifier which minimizes contact wear and allows load switching to 65 VA. In this design, an adjustable contact is coupled to the gauge pointer through a special adaptor. As the contact approaches the set pointer, the magnetic force of a small permanent magnet attached to the set pointer assists in closing and holding the contacts in place. This avoids arcing and reduces contact wear. The switching amplifier further reduces potential wear by its ability to switch large load currents with small control current. Technical specifications are listed in Table 1. These switches are designed for alternating current (for DC consult WIKA).